This is where the Second World War hostel buildings – aka the ‘hutments’ – used to be. I went on about these buildings at such length that I bored myself. An update is overdue, however. This photo was taken on 5 July, from the car park behind King’s Manor, looking over its boundary wall. St Mary’s Tower with its conical roof is at the back, Bootham’s buildings in the background on the right. The foreground is where the hutments were. 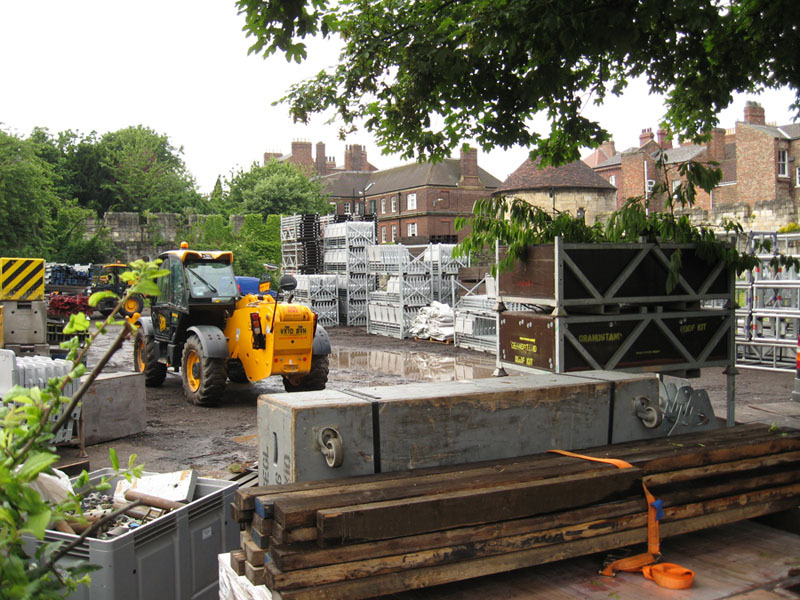 It has been used as a temporary storage area for the seating and staging in connection with this summer’s Mystery Plays, and parts were being transported from here to the nearby abbey ruins. It had been suggested that this might be a new garden area by spring 2012, but clearly it’s currently more useful as an open space (albeit a muddy one) for use by the construction team. The exhibition on the plans for the gallery included this area behind it, and asked for our ideas. They have properly qualified, experienced staff working on this important botanical garden, and I imagine the planting is already fully planned out, so I don’t think they really need ideas. 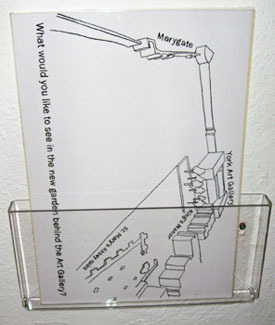 But sheets were provided with the basic framework marked out, with the caption ‘What would you like to see in the new garden behind the art gallery?’. I toyed with the idea of sketching some wartime hostel buildings in that empty space. As a joke, you understand. This area is flattened, changed, is useful, and moves on. Interested to see this subject is moving on. It was however quite interesting that the old buildings had survived as long as they had. Thanks for this update. Enjoyed your little evil plan to send a reply noting the old buildings!